“When the moon hits your eye, like a big pizza pie, that’s amore. In the scene, Cher wakes up in bed with Nicolas Cage and completely freaks out. As anyone would. Cage plays a one-handed guy named Ronny, the brother of Johny, the man that Cher is about to marry. So sleeping together was a terrible idea, especially given the spate of bad luck that has followed Cher’s character all her life. But it can’t be helped, because Ronny is in love with her. Which brings us to my favorite moment, when Ronny expresses his love and Cher slaps him in the face and yells, “Snap out of it!”. Sometimes that’s just what you gotta do to get someone’s attention. It’s just like making this deep dish pizza, now that I think about it. But I bet you are wondering how the pizza crust tastes. I’m happy to report that this low carb deep dish crust tastes great. The classic crust is thick and bready and is just the slightest bit undercooked in the middle just like real Chicago Style pizza. But unlike normal deep dish pizza, which can have as much as 120g carbs per slice, this pizza pie has just 5g net carbs per slice. Now, you can fill your deep dish pizza with just about any pizza topping you want. For this recipe, I used mushrooms and pepperoni, but feel free to be less boring. As long as you stay away from Hawaiian style pizza, then you’re good. So good, in fact, that you may just fall in love with this deep dish pizza. And for that I have just four words: SNAP OUT OF IT! 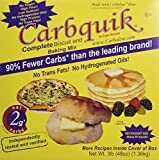 If you liked this low carb Carbquik recipe, then you might like my recipes for Tomato and Herb Focaccia, Beignets, or Yeast Bread Dinner Rolls. Yes, Carbquik does have salt in it. Sorry you found the crust too salty! It tastes just right to me, but everyone has their own preference about salt. But I’m going to ease back on the salt in the recipe in case other people think it’s too salty too. Thanks for letting me know! Okay, that was so fun watching that clip from Moonstruck, which I feel like I haven’t seen in 100 years! And the pizza sounds and looks over-the-top delicious! Thanks! Yes, I need to rewatch the movie now. Wow, that crust looks fantastic very appealing and with crunchy edges. I need to make this low carb option for my family as we love pizza. Thank you so much for making this a low carb option. Now I don’t have to miss out on pizza night anymore. Love it! Sure! I know that ordering regular pizza can be rough. Constraining yourself to just eating the cheese and toppings is no way to live! Thanks for the tip about the low carb baking mix. I have never seen that before but will have to see if I can find it! So great for pizza night! Yes, Carbquik is a great mix to have in your back pocket. I’ve only seen it on Amazon, so they’s where I buy it. There’s a link for it underneath the recipe.